These two young players from the BBC Symphony Orchestra play with a commitment and imagination that lifts this beguiling music right off the page. 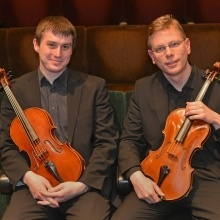 In such skilful hands these two exquisitely played violas often sound like a full string quartet. The second half of this fascinating programme explores Eastern European repertoire including the classical sonata of the Bohemian composer František Benda and the politically charged Soviet Sinfonia of Fyodor Druzhinin. The concert also includes the première of a short work by young local composer James Wilson.